Forget Virginia: Chile is for lovers. Let me break down the reasons for you. First, the typical greeting between men and women is a kiss on the cheek, not a handshake. In this respect, the cultural transition is easier for women because they just kiss everyone. When greeting a group of people, we men have to make a dozen split-second decisions centered around the crucial question, do I kiss this person or not? It’s easy to make mistakes; I, unfortunately, would know. Anyway, think about the number of given handshakes you exchange in a given day and tally those in the kisses column. So add the number of people you greet daily to your earlier tally, then double to account for goodbye kisses as well. That’s more-or-less your cheek-kiss count for a typical day. The third aspect of the prevalence of kissing in Chile, however, is the hardest to get used to. In the U.S., a couple just has to breath too close to each other and friends will cough, clear their throats, and shout “Get a room!” If your friends don’t react this way it’s not that they’re more accepting; they’re just saying behind your back instead. But as far as I can tell, a negative preception of public displays of affection doesn’t exist in Chile. On any given day you see routine, passionate displays that make Titanic and Casablanca look like tame children’s fare. The subway is a good venue, where kids go to hang out and hook up after school. The spectator experience is enhanced by the cramped quarters: often this is happening 18 inches from your face. No joke. At least that’s how I remember it. If you want more stories, I have fistfuls. There was the couple kissing in front of my house when I went grocery shopping and when I came home half and hour later. There is Parque Santa Lucia where I counted 15 amorous couples. 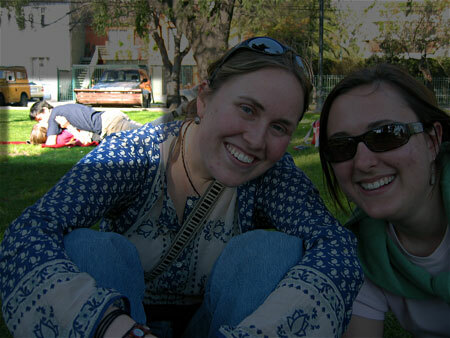 Then there was a certain photo from last year: I uploaded a picture of Caitlin and Emily to Flickr and the next day I got an email from my friend Amanda wondering, “should I ask what is going on on the lawn in the back of the picture?” Well, nothing out of the ordinary. It was just Sunday in Plaza Ñuñoa. My take is that people make out in public, ironically, so they can get some privacy. In their houses they live in such close quarters that it’s better to be in public where the family isn’t. Or maybe it’s part of my fabulous tourist campaign: Chile is for lovers. Iâ€™m a fairly clumsy personâ€¦ I brush into things, Iâ€™m plagued with two left feet, and finally Iâ€™m right/ left challenged. Anyway, I found that I was a rather awkward kiss greeter. It took me a while to get the coordination down. Right first, left first… it was a mystery at first. I donâ€™t know why, but I would never have noticed the couple in the background of that shot. Even when defined with the box, it would have taken me a second to notice. I may be less observant that I would hope. bueno yo soy chilena y me he venido por un tiemepo a Suecia, ya pronto vuelvo a chile, pero asi como a ti te impresiona nuestra facilidad para besarnos, a mi al principio en suecia me espaanto lo frio de la comunicacion aca, el metro cuadrado de cada persona es muuucho mas grande en US o EU, y si aca uno se acerca mucho a alguien para hablar inmediatamente piensan que es acoso… jajaja ahi se ven las diferencias de las culturas. En un curso de mi universidad aca yo estabaa feliz cada vez que llegaban los franceces, porque me aban 2 besos y aunmentaba mi cuota diaria, estaba con deficit de cariNo… ya ahora mas acostumbrada, pero igual prefiero besar a quienes conozco, no asi a tooodo el mundo. Un abrazo y feliz 18, que sigas comiendo rico y pasandolo bien. Try WAY more uncomfortable for women! btw, I linked to this story. I guess you have to decide whether it’s more uncomfortable for a woman to kiss a bunch of sleazy guys or a man to kiss another man in homophobic Latin America. I’m going to stick with my choice, but I can see how women wouldn’t be crazy about their option. yo soy gringa, pero a mi me encanta dar besos y abrazos a la gente cuando la conozca de primera vez…I guess I’m just an open minded, loveable gringa!!! Giving his reason for climbing Mt. Everest. He later died on the mountain.